This week, I'm venturing into the creepy sub-genre of alien invasion by unexplained monsters. These creatures sit at the opposite end of the spectrum from Thomas Newton in The Man Who Fell to Earth. The primary example of this enemy is The Blob, a giant mass of alien matter that engulfs everything that it touches. I'd never seen the 1958 original, so this marathon gave me the opportunity to check out this classic sci-fi film. I have watched the '80s remake with Kevin Dillon, which is entertaining but forgettable. It's time to look back at the inspiration for that film and many other alien monster movies. Teenagers Steve Andrews (Steve McQueen) and Jane Martin (Aneta Corsaut) are enjoying a romantic night and spot an apparent falling star. They don't realize this is actually an alien entity that lets out a strange blob. It attaches itself to an old guy and starts engulfing him, and that's just the beginning. While Steve and Jane try to convince the authorities that the blob is wreaking havoc, it starts taking out unsuspecting townspeople. The alien mass is continuing to grow, and weapons don't seem to have any effect on it. The situation looks dire and could lead to the end of life as we know it. 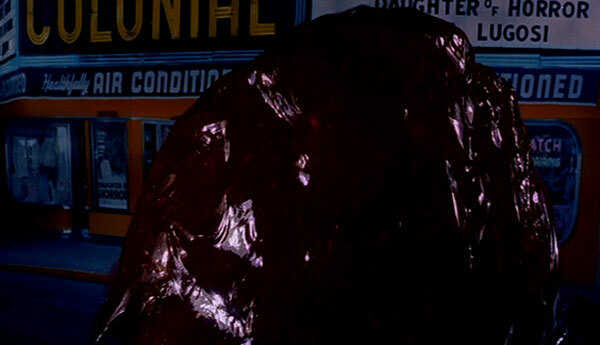 The blob glides through a movie theater and a local diner, and nothing can stand in the way of its unending feast. Although it functions primarily as a fun horror film, you could look at The Blob as a Cold War parable. The red mass is slowly destroying the world and taking over unsuspecting minds, and no one can stop it. The final resolution also involves cold, so that adds another layer. I don't really buy it, but it does fit with the paranoia of late '50s America. Even if it wasn't the writers' intention to craft a warning about Communism, the climate likely influenced them in some way. You could also read this story as a praise of intelligent youth against the close-minded adults. Steve is fairly responsible and wants to save the town, but some of the cops and other adult simpletons don't believe his wild tales. 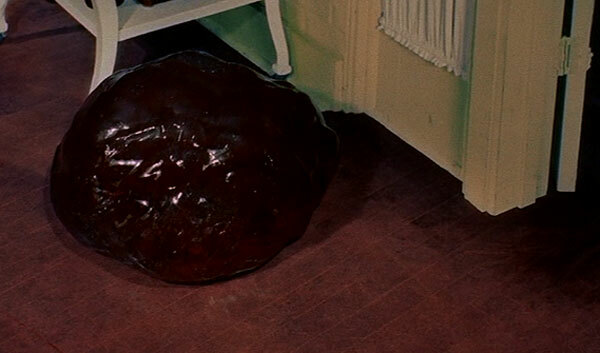 I love the simplicity of the way the blob arrives on Earth. 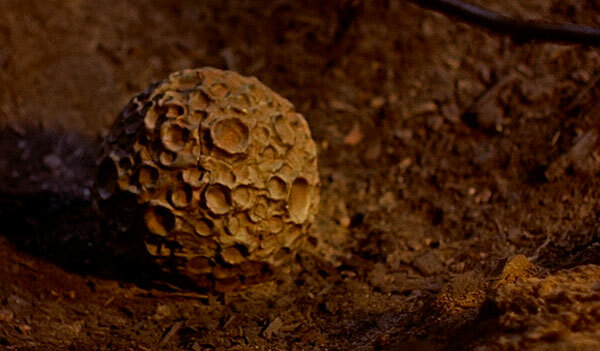 It rests inside a simple sphere no larger than a human hand. This lack of an apparent threat is what draws the old man (Olin Howland) to start the mess. Viewed from a modern perspective, it's hard to say whether the blob is original. We've seen so many examples over the years of this type of mysterious alien presence arriving on Earth. The set pieces involving the blob aren't that exciting, but watching humans run from a slow-moving mass of goo is still entertaining. The monster isn't that interesting, but the over-the-top reactions are priceless. Created from silicone and red dye, the blob is very silly and moves extremely slowly. It's really entertaining the watch the characters freak out in a grocery store when pursued by this creature. You're not trapped! Just walk away! Given the era and low budget (just over $100,000), there are some impressive effects. The best examples involve stop-motion animation as the blob seeps around doors and through vents. These moments are a lot more effective than the close-up shots of it bouncing up and down. It's not a scary alien, but we don't get too many shots that last beyond a few seconds. This is a wise move. Not really. Each person fits a certain archetype (the brave hero, his goofball buddies, the skeptical cop). 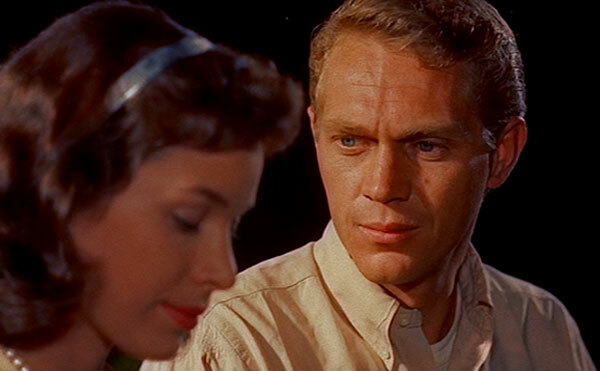 Also, it's hilarious that a 28-year-old Steve McQueen is playing a teenager. His severe looks make him seem even older, so having actors who aren't much older talk to him like a irresponsible kid is silly. 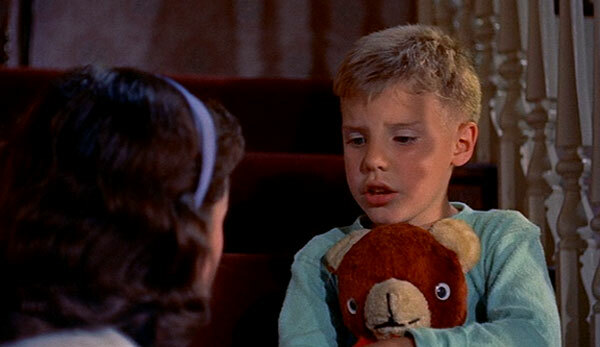 This is McQueen's first film role, and he's much less assured than in his heyday. Aneta Corsaut was 25 at the time, so at least it's not weird to see her getting romantic with McQueen. Neither actor is amazing, but they do a decent job selling the material. The same can't be said for Jane's irritating little brother Danny, who's played by Kieth Almoney. His flat line readings are wonderfully hilarious, and it's no surprise this was his only movie role. It's hard to be too rough on the acting in a low-budget horror film, but there are a few moments that take you out of the story. Although The Blob has its shaky elements, it's also entertaining and doesn't overstay its welcome. Clocking in at a brisk 82 minutes, the story avoids unnecessary subplots. The blob is silly but provides fun highlights, particularly in the famous movie theater scene. While the audience watches a midnight horror movie, it eats the projectionist and then seeps through the vents and towards the crowd. 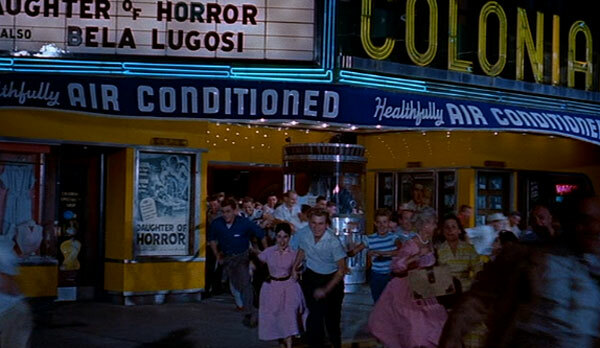 The climax at the diner is also great and includes the odd image of the blob covering the building. The structure doesn't look permanent, but it thankfully has a cellar to give the characters a chance. The question mark ending is a fun B-movie device that closes the story on just the right note. I'd also be remiss if I didn't mention Burt Bacharach's very literal song "The Blob", which plays during the opening credits. It's definitely worth hearing if you're looking for a good laugh. One of my favorite cheesy 50s horror movies. I love that its obvious a lot of people fleeing the theater are laughing. Dave, it's definitely cheesy and pretty entertaining too. I'm glad that I finally got a chance to see it. I'm glad you mentioned what age McQueen was. I took one look at that photo and nearly laughed out loud after reading 'Teenagers Steve Andrews (Steve McQueen)...' Curious but not desperate to see this! Pete, it's so ridiculous. It took us a while to realize for sure that they were teenagers. I thought maybe they were at least in college or something. 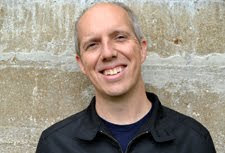 McQueen looks like he's 35! I might have seen The Blob when I was a kid but I did not remember Steve McQueen at all. That blob thing-y is the only thing I remember being grossed out of, ahah. Ruth, I'm guessing you forgot McQueen because he's not that memorable. The most interesting thing about his role in this movie is that he's way too old to be playing a teenager. The blob looks more silly than gross, but I can see it being icky.